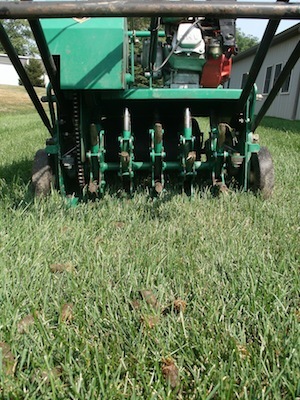 Fall Lawn Care Aerations - Shouldn’t You Pick Up All Those Plugs? So you’re either looking to have an aeration performed, or just had one done. “Why don’t they pick up all those tiny little plugs that look like goose poop in my yard?” Contrary to believing that we’re just in to much of a hurry to pick them up, there is a good explanation of why we leave them, and why they are so good for your lawn! I know they’re ugly, but taking all those plugs out of the surface helps you lawn tremendously by providing pockets for roots, water, and fertilizer to penetrate deeper in you lawn. As the stressful summer went by and the soil became compacted, roots stopped being able to grow downwards, and grew towards the top of the surface in search of moisture. The pockets will help stimulate root growth, relieve compaction and reverse this effect. Believe it or not, but those plugs contain organic material, such as thatch, that will break down and serve as natural lawn food. As the plugs slowly dissolve, the plugs will decompose turning into a compost-like mixture. This is a good thing for your lawn and will provide nutrients to your turfs root system! Lawn care in Ohio usually means dealing with a lot of clay soil. Unfortunately the only thing you can do to deal with clay soil is to provide air pockets for roots to grow into, and hopefully down. As you continue to aerate over the years, this is really your only way to break up the heavy consistency of the clay surface, and allow areas of your lawn to breathe. A top dressing of compost is recommended for heavy clay areas, and mixes up the consistency of the soil. We hear it all the time, “how long do I have to deal with those plugs?” While we may agree that they look like goose poop, typically plugs dissolve over 2 to 4 weeks. However, these plugs are beneficial to your lawn, and putting up with them over the next month is well worth it! Aerating your lawn is only one step towards repairing your lawn for this fall. Download Weed Pro’s Five Steps to a Fall Lawn Recovery and learn other ways to ensure that your lawn looks its best this fall and next spring! Get your FREE copy by clicking the link below!